The Southern Outer Banks are gaining popularity as a surfing destination, for newcomers to the sport and advanced borders alike. With mainly south or southeast facing beaches, and seasonal swells that are enhanced by passing tropical systems or nor’easters, surfers can catch the ride of a lifetime on the Crystal Coast if the timing and conditions are just right. In addition to the pier-adjacent beaches, surfers will find a number of popular public spots that can transform into decent surfing beaches when there’s a swell. The Fort Macon State Park has several beach access points, including a large one that’s in between the park and the town borders of Atlantic Beach. Here, boarders will find plenty of parking spaces, seasonal bathrooms and outdoor showers, and summertime vendors for easy refreshments. The Circle in the heart of Atlantic Beach is a popular spot too, and is a good starting point for beginners, thanks to seasonal lifeguards. Boarders will just want to use caution, as this area is heavily populated with swimmers, fishermen, and other beach-goers who are enjoying the water in a myriad of ways. The Eastern Regional Beach Access is found on the eastern edge of Emerald Isle’s borders, and is an attractive destination for visitors staying in the central beach towns of Indian Beach, Salter Path or even Pine Knoll Shores. This site also provides ample parking and a boardwalk to the beach, making it easy to lug along gear. The Western Regional Beach Access is located in the heart of Emerald Isle and features several dozen parking spaces as well as easy access directly to the beach. Situated in the heart of town, this beach can also get populated in the summer season but is a solid option for visitors who don’t want to travel too far to reach the waves. The southern Outer Banks beaches are famed for their shallow slope that gradually descends, and which makes it easy to “walk out” into the ocean. As a result, waves can break fairly far from shore, (especially during a low tide), but falling off the board can result in hitting the ocean bottom pretty easily. The great news is that because of the Crystal Coast’s geographic position, tropical systems that can crash into the northern Outer Banks beaches often miss this southern shoreline, and as a result, surfers can enjoy fairly great swells with lesser risks when a tropical system passes just offshore. This means that there can be much better surfing conditions in the prime summer and fall months, and the spring season – with its occasional run of nor’easters – can be prime time for catching the waves as well. There are several websites that are dedicated to regional or local surfing reports, so surfers will want to pay close attention to see if there are waves – especially during hurricane season. Considering that the Crystal Coast is roughly a 2-3 hour drive from major NC cities like Raleigh, it’s very possible to drive down when the swell arrives to enjoy some great waves for the weekend. Watch for days with a forecast of southwest winds, which can produce larger than normal and completely rideable waves. 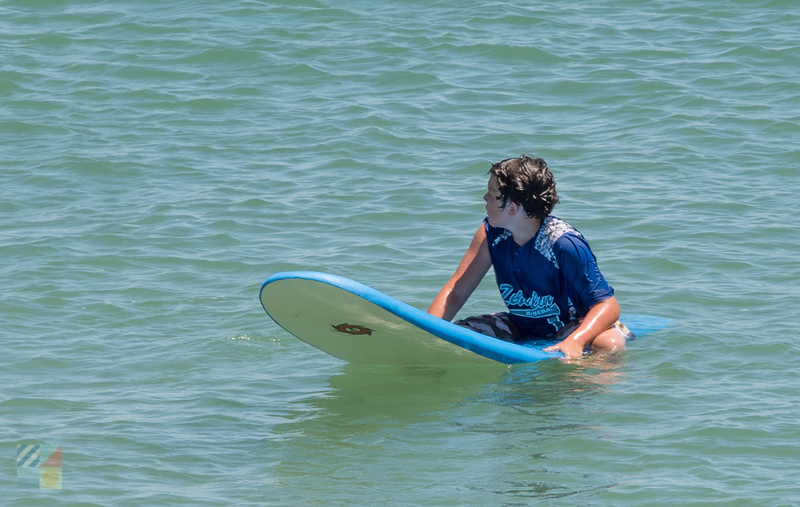 Because the Crystal Coast beaches have a naturally gentle sloping shoreline and traditionally smaller waves, the shoreline is an ideal spot for beginners who want to learn the basics of wave riding. Not surprisingly, a number of local camps and instructors are available for visitors throughout the Emerald Island communities who want to learn. Private instruction is typically available on an hourly basis for visitors who want to learn one-on-one from a trained instructor, or in a small group size of roughly 2-6 students. Visitors can start their search by heading to the local surf shops, which often offer seasonal summertime lessons in addition to equipment sales and rentals. The Crystal Coast is also home to several Surf Camps, like the Hot Wax Surf Camp in the town of Emerald Isle. These full day or even multi-day surf camps serve as in-depth tutorials that can get students standing on a board in no time, and which are perfect for new boarders who want to learn how to ride in a hurry. Surfing lessons and camps are generally available in the summer months, but may also be offered in the spring and fall seasons as well. Wintertime instruction may be available by appointment, as the beaches are generally a little cold and unpopulated, and not necessarily ideal for new surfing students. There are roughly a dozen surf shops in and around the Crystal Coast, which includes shops in the beachside communities of Emerald Isle and Atlantic Beach, as well as shops that are slightly inland and are located in the towns of Morehead City or even Beaufort. Atlantic Beach, which is easily the busiest beach town along the coastline, is a good place to start for equipment and rentals, as the majority of surf shops are found in this section of the Crystal Coast region. Check out local established shops like Bert’s Surf Shop, Atlantic Beach Surf Shop, Tony’s Surf Shop and Marsh’s Surf Shop for a wide variety of boards, gear, rentals, and accessories or clothing. The town of Emerald Isle is also home to several established surf shops like Hot Wax Surf and Paddle Sports, and South Swell Surf Shop. Visitors will also find several watersports rental companies in the area, which are good places to pick up board and / or wet suit rentals – two costly investments when it comes to surfing equipment. Most boards can be rented fairly inexpensively on an hourly, daily, or even weekly basis, ensuing that visitors can enjoy them all vacation long. Surf shops may also offer used boards for sale for the budget conscious, as well as brand new boards from a wealth of different brands for surfers who want to take the plunge and enjoy a lifelong habit. For the best bargains on equipment, look for “End of Season” sales. Several local watersports shops and rental companies may sell their used equipment at a steep discount in early fall, after the prime summer season is over. Before you paddle out into the water, be sure and keep these things in mind to make the most out of a Crystal Coast surfing expedition. Bring water repellent sunscreen. The sun is especially potent on the water, even if you’re spending your time actively paddling around. If you’re new, wear a rash guard. New riders who are not use to wave riding can potentially acquire a painful and red rash on their chest during their initial surfing expeditions. Watch out for the crowds. Many of the popular beaches along the Crystal Coast can be thick with swimmers, paddle boarders, ocean kayakers, and fishermen, so use caution when riding the waves. 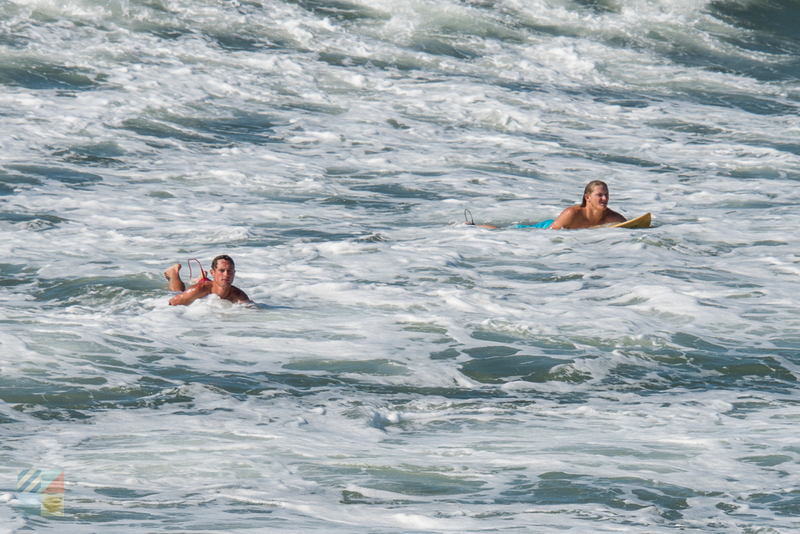 Need bigger waves and don’t want to wait for a tropical system or swell? Try heading north or south. 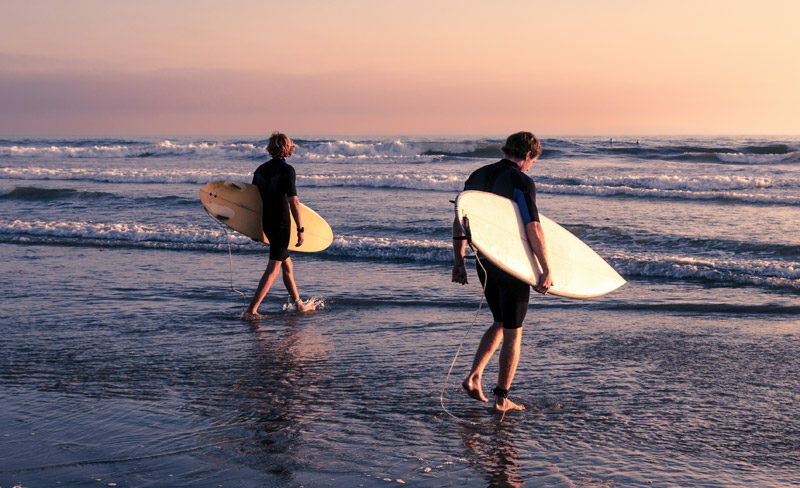 The Hatteras Island towns of Buxton and Rodanthe as well as the southern beaches of Wrightsville and Carolina Beach are both well-known surfing destinations in the state of North Carolina. Want to check out a NC surfing tournament? There are a number of tournaments that are held just south and north of the Crystal Coast near Wilmington to the south and on the Outer Banks to the north. Look for annual or semi-annual tournaments sponsored by ESA and other big surfing organizations to join in the fun. Surfing on the Crystal Coast can be a blast for experienced and new boarders a like, and the generally gentle waves provide fine training grounds for visitors who want to get their feet wet in a new sport. With miles of shoreline to go around, and plenty of surf shops throughout the landscape, learning to surf on the Crystal Coast can be as easy as grabbing a board and heading out into the water to have some fun.